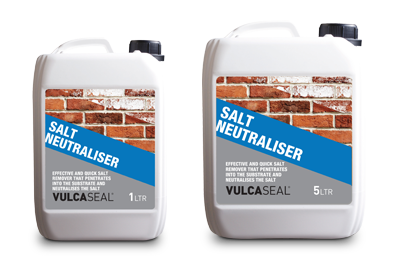 Vulcaseal Salt Neutraliser is an advanced salt neutralising formulation that does not harm the substrate in anyway. Not only does it remove salt on the surface, but penetrates deep into the substrate, preventing reappearance. 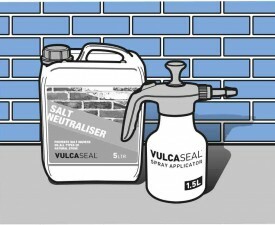 Vulcaseal Salt Neutraliser can be used on any surface where salt build up occurs such as patios, natural stone, masonry and other stone surfaces. Always carry out a test first to ensure the finished result is acceptable. For very heavily contaminated surfaces, use a suitable cleaner from the Vulcaseal range first. 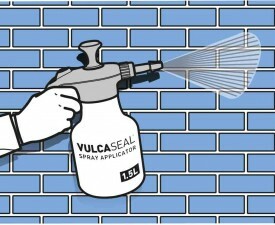 Pour the product into the Vulcaseal Spray Applicator. Spray generously onto the contaminated surface. Allow the product to act for 1 hour and then reapply. 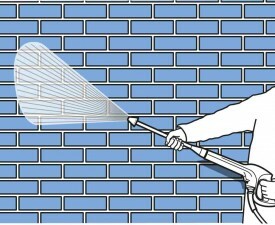 Leave for a further 24 hours and then wash away surface salts with a power jet or brush using a dilution of 1:50 water. 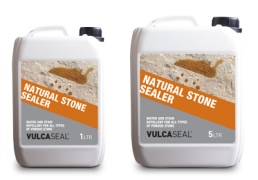 Once dry, protect the surface with a sealer from the Vulcaseal range. Does not alter the aesthetics or nature of the substrate. Penetrates deep into the substrate. Up to 5m² per litre. Surfactants and foaming agents: comply with European Directives EEC 82/242 and 82/243. 12 months in unopened container, stored in dry and frost free conditions. Wear safety goggles if splashing is likely. Heavy salt residue on stone surface. Result on surface after using Vulcaseal Salt Neutraliser.